I’d been planning to remove my content since reading about how Facebook uses extremely persistent cookies to know and track every page you visit even if you are logged out. When I read that Facebook was going to make the view of a user’s entire history mandatory, I decided that I’d procrastinated long enough and it was time to remove my content before the timeline was rolled out to my account. As proof, I even made a snap of my empty profile page in the pre-timeline format. All of which goes to show how much I trusted Facebook at this point. Although I was pretty sure I wouldn’t change my mind, I had decided I didn’t want to delete my account altogether just yet. I figured that by keeping the account, I could at least keep an eye on it from time to time without being active. Having finally removed everything, I didn’t worry when Facebook completed activating the timeline, safe in the knowledge that mine was empty. My loathing for logging in to check my profile was stronger than my distrust of them and so I made a critical mistake: I never logged in to check! How could Facebook bring back all of my posts after I had deleted each and every one of them? That’s not right. 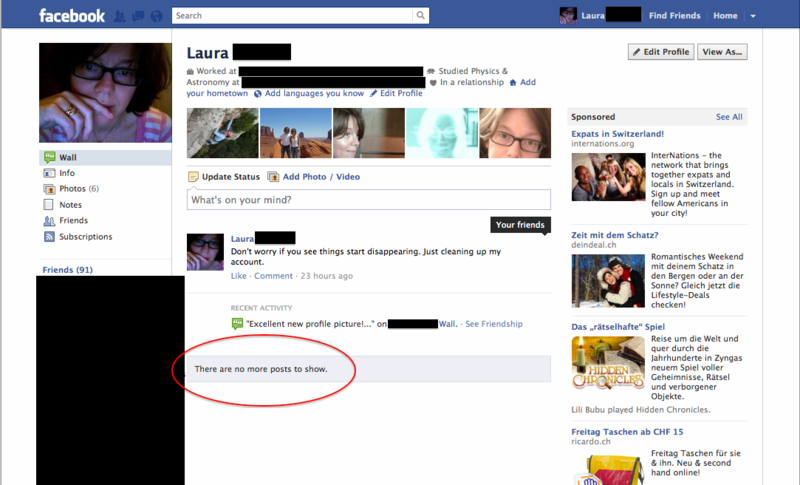 Facebook apparently does not understand what a user expects to happen when they delete something. I made a quick web search and found out that I’m not the only one who has had deleted posts reappear. You can find a some examples here and here. People don’t seem to find it’s a big deal; however I didn’t see anyone that mentioned having deleted all their posts to have them reappear. After my discovery, I spent yesterday evening removing all my posts from my Facebook account a second time, but in all the excitement I didn’t realize that I’d forgotten to take a snap of the un-deleted posts on my timeline until after I’d already cleaned it again. I did get another snap of my empty timeline, and I certainly won’t forget to document it if the posts reappear again. I stopped using Facebook because I distrusted them, and what I discovered yesterday only confirms that I was right. A word to the wise: don’t count on deleting your information; Facebook, it seems, is indeed forever. Like smoking, the best way to keep from getting hooked is never to start. Update: I forgot to mention how useful Backupify was in writing this post; I could not have found those dates and tweets so quickly without it. This entry was posted in Facebook, Privacy. Bookmark the permalink. so right…..facing the same problem………….deleted posts as back as 2009 surface again………………..i am thinking of suing them………. I am having the same problem. And the help seach on facebook does not cover the issue although it has been talked about repetedly. Has there been any solution found yet (appart from quitting facebook altogether)? Sorry to hear you’re having the same problem. I have had neither the time nor the inclination to check the current status of my timeline or do any additional research on this topic. I had hoped that with some visibility, Facebook would have taken the necessary steps to fix the issue. Apparently they have not.